When I mention that I’m a professional costumer, people often get wide-eyed and respond with an awed “ooohhh…” While costuming has it’s moments of “wow, I love my job!”, in reality, most of what I do is simply just work – and by work, I mean the dirty physical-labor kind. Being a costumer is more than sewing. There are those costumers who do spend a lot of their time in a costume shop (and I admit that is my favorite place to be! ), but even working in a shop involves more than just putting together pretty period garments for film or theatre. There are tasks like making repairs to old (sometimes stinky!) costumes, polishing shoes, and rigging a costume so that it can be put on or taken off quickly. There is also the distressing of clothing & shoes to make something look old or worn, and there is dyeing fabric – both of which are messy and require true artistic skills that I have not completely mastered. 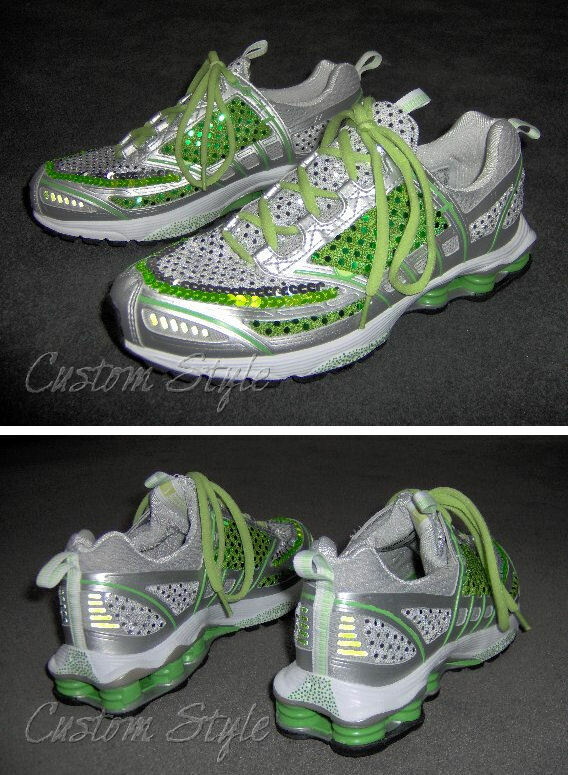 This was a pair of name-brand shoes that I meticulously greeked out (per the costume designer) for an episode of Barney & Friends when a script called for “fancy dancing shoes”. They are Nike brand – can you tell? Then there is basic stuff like laundry. It’s never-ending! I may be able to look inside a designer labeled outfit and touch amazing custom garments, but I also have to collect sweaty socks at the end of a day. Sometimes laundry has to come home with me and go back clean the next morning (and that’s after a 12+ hour workday!). During the last few days, I was hired to do some stitching for a Nike commercial that was filming in Dallas. (You can view it in this post.) I hemmed some pants, took in some t-shirts, and tailored a few suits. But I also helped unpack shipments of clothes that arrived by mail. 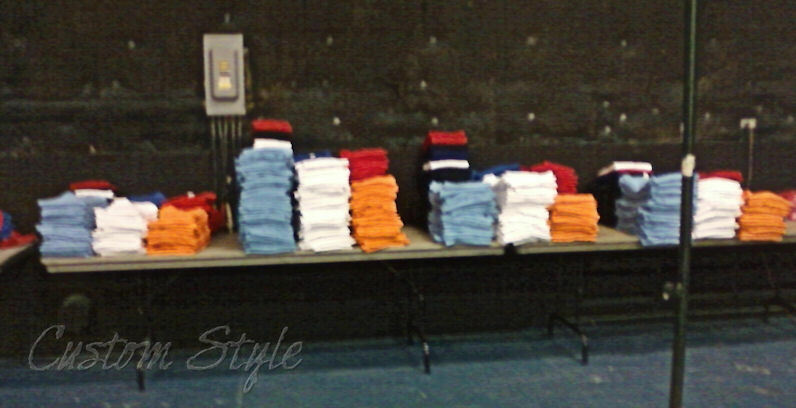 I did a lot of clothes hanging, and I folded & sorted something like 600 t-shirts! Ahhh the glamour! I was a folding machine! It was grueling, but the costume designer & wardrobe crew I was working with were really great people and I’m glad I was able to meet them. I’m sure I will cross paths with them again at some point – it always amazes me how small Hollywood is (instead of 6 degrees of separation, it’s more like 1 or 2)! 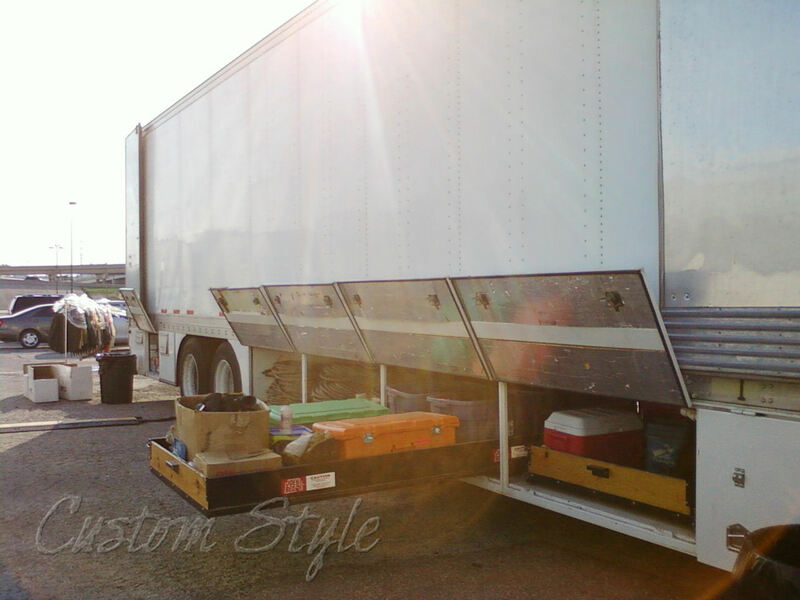 On some of the bigger shows where I’ve been hired on as part of wardrobe department, we have a full-sized semi-trailer for all the costumes. 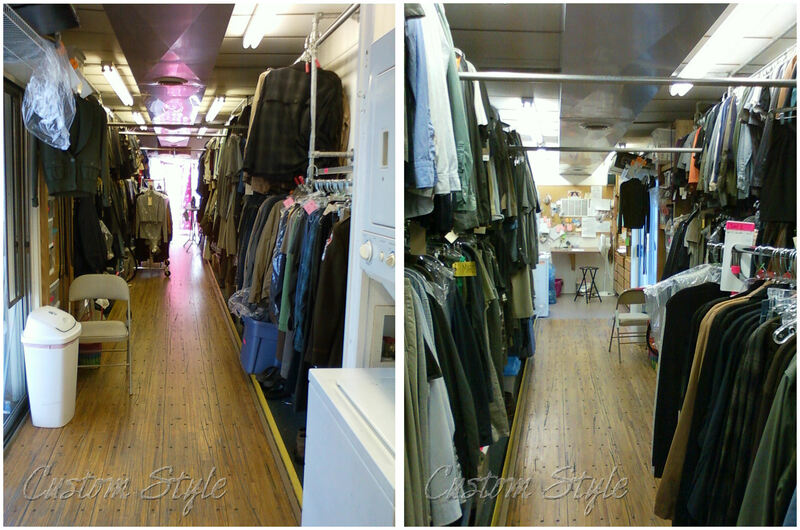 This was the Chase wardrobe trailer. It even had pull out drawers in the compartments below! On filming days, a crew shows up (usually before the sun rises) and finds Basecamp set up in some random parking lot near the shooting location. Half the time, it is easy to forget where you are because the trailers are usually set up in the same basic configuration. 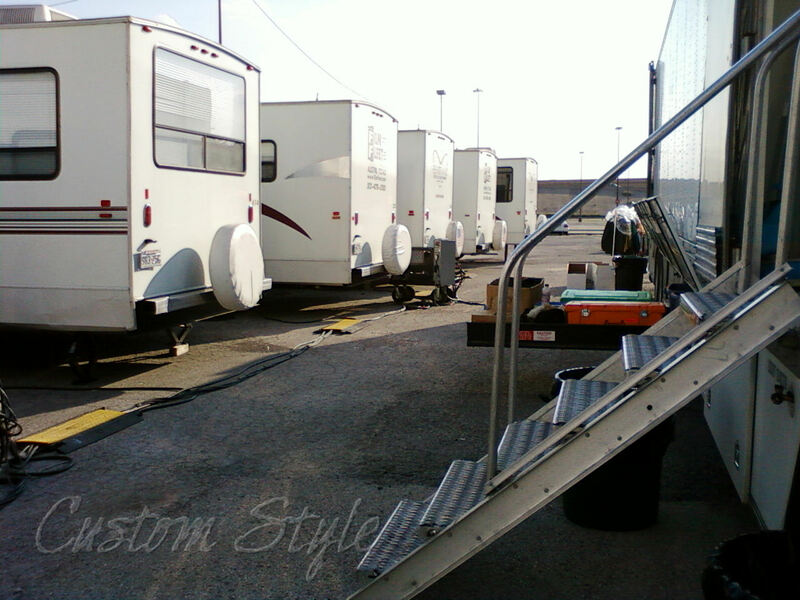 A view of Basecamp from the bottom of the Wardrobe Trailer stairs. Inside a wardrobe trailer, there is often a stacked washer/dryer, a small sink, and a few cabinets and counters in the nose. All the way down the sides are locking clothes racks, and a ramp on a lift at the back end. and a view looking toward the nose of the trailer (R). Aside from lugging costumes and pushing racks of clothing all over the place, I’ve met and talked to countless interesting people, seen the other side of many “do not enter” doors (I often joke that I don’t know how to enter a building through the public front door), learned how “boring” action scenes & how “funny” horror scenes can be while filming them, worked some 19 hour days (the standard minimum day is 12 hours on most jobs), and been a part of some truly amazing teams. My job as a costumer involves so much more than sewing (and I didn’t even mention the on-set work!) that it’s hard to summarize when someone asks what I do. Costuming (and any film or theatre job for that matter) is a calling – one that sounds glamorous and usually isn’t. It can be miserable and completely exhausting at times, but despite all the hard work involved, I would never trade what I do for a normal desk job! I love your post, and yes…. I’m one of those that ‘oohhh’ when I hear costume designer. In the 70’s I tried to get into FIT but the fact that I couldn’t sketch was a major issue. Many moons, kids, and life in general has taken hold, but I still dream of the glamor. I’ve personally costumed local schools and theater (volunteer of course) for many years so I’ve gotten quite a taste for the non-glamorous side of the spectrum, too, but it is truly rewarding when it all comes together. Thanks! All jobs are plain old work at some point, but I really do enjoy the feeling of having actually done (usually accomplished, but not always) something by the end of the day. And I’m still trying to convince my Dad that I don’t want to be a costume designer – I only enjoy designing on a small scale, but I LOVE being one of the other costumers for the bigger productions. I still have glamour, just on a smaller scale with a more manageable schedule and I don’t have to deal with doing my customers laundry! I’m always glad to get work and I usually enjoy having been a part of it in the end, but I am always glad when a job is over! Freelancing can be stressful waiting for work, but man! I could NOT do it non-stop – it can really beat you up! I’m glad I have some dead times. I really like the easy schedule of my home business – I just wish I could work with others when I’m doing my stuff and not be by myself. Brooke, thanks for sharing this! I’ll confess to being one of those people who’s bewitched by the idea of being a costumer. I will say, though, that I love that feeling of rushing to meet a deadline and putting in crazy hours (very similar to teaching! )…maybe one day I’ll get to try my hand at something like that. And yes, there are crazy deadlines because so many people (even in the film world) think that costumes just “happen”! I’ve spent a few all-nighters on the job – something I never once did in college! Thanks, Brooke, for this fascinating synopsis of your profession. As one who spends as much time looking at the clothes on the screen as focusing on the story line, I appreciate hearing about the behind-the-scenes costuming. That’s really a great look at what you actually do vs. the perception of what we think you do. People who are hoping to join your field should all have to read this first! 🙂 Your work does sound really exciting, but yeah, I am sure that it can easily become tedious at times. Like the cheerleading job??? Urg – the cheerleading sample making job was a bad deal from all directions. Management stupidity was what ultimately made it unbearable. Great post! (I found you through Cation Designs) I work in theatre as a stage manager, so I know what costuming is really like, but it was cool to see how movie costuming is both the same and different. Thanks! Yeah, the differences are subtle between stage and film – I like them both for different reasons. How strange that the actors are amazed you sew your clothes! Some actors think I make everything I wear, which just makes me laugh – when would I have the time?? I wish I had more time to sew for myself than I do (it’s the whole cobbler’s kids have no shoes), but I have managed make myself a few things over the years. It’s the alteration pile that I keep putting off because that is the most boring kind of sewing and it’s probably what I do the most at work.